Doing a few quiet exercises, such as coloring, is a great way to work on fine motor skills during the holidays. The stockings are hung by the chimney with care, the tree is sparkling with bright and beautiful lights, and you are savoring a quiet cup of cocoa by the fire—wait a second, whose life is this? Winter break with children doesn’t just mean lingering by the fire with a book. If you are a parent of a child with special needs, you are concerned about your child maintaining therapeutic momentum over the holiday break and getting everything done for the holidays, so how can you do both? Keeping it moving over holiday break is important for you and your children. 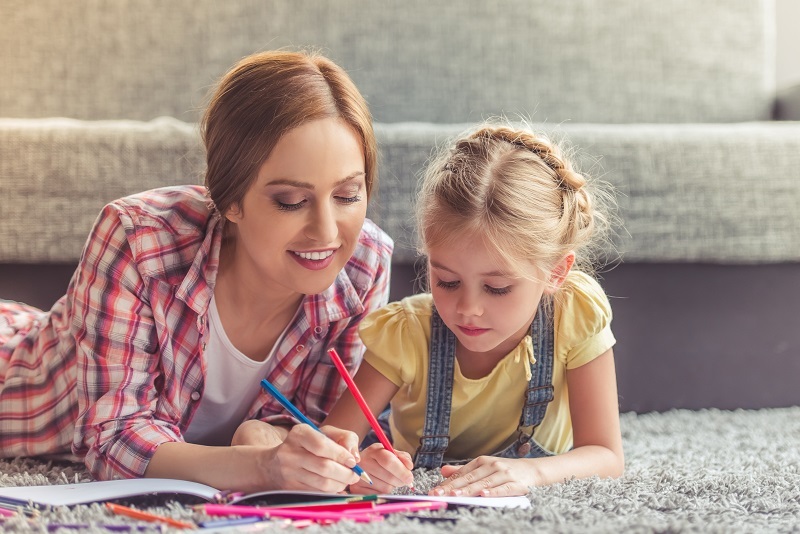 Try to schedule activities close to when your child would be doing them in school to maintain some of their typical routine. Relaxing by the fire one night is okay, but don’t let the television or reading become a substitute for physical play. When you do spend time indoors doing quieter activities, arts and crafts can be a great way to have fun and maintain therapeutic momentum. Come up with an easy centerpiece, cute place cards, or other simple decorations that your child can make. This is a great confidence booster and will also help to maintain their fine motor skills, scissor skills, writing, and attention skills over the holiday break. You schedule time with your significant other, so why not schedule time with your child? Talk with other parents in your child’s class about scheduling a play date over the holiday break. You can also go to a fun place together, like an art museum, science center, or kids’ museum, to engage in sensory and learning activities and maintain therapeutic momentum. Most importantly, have fun spending time together as a family! You don’t have to keep your kids preoccupied all by yourself during the winter break! Connections Therapy offers a Winter Camp for kids where they can work with therapists on their therapy goals in a fun and stimulating (or non-stimulating) environment. And don’t forget, we also offer spring break and summer camps as well! The Connections Therapy Center serves families of children and adolescents with disabilities and special needs. We are a team of experts in the fields of pediatric speech, occupational therapy, speech-language pathology, and behavioral sciences. As a team, we offer intensive hands-on therapy for children and adolescents, as well as informative and useful resources for families. If you are interested in learning more about what we can do to help your family, visit us online or give us a call at (202) 561-1110 (Washington, D.C. office) or (301) 577-4333 (Lanham office). Want to get more information on how to help your child thrive? Follow us on Facebook, Twitter, LinkedIn, Google+, and Pinterest. This entry was posted on Friday, December 16th, 2016	at 3:09 pm	. You can follow any responses to this entry through the RSS 2.0 feed. Both comments and pings are currently closed.